I used to teach a graduate course in professional ethics for the educator. One of the assignments I did is have these inservice educators develop a list of promises to their students. I asked them to make it poster size so they can post these promises in their classrooms. 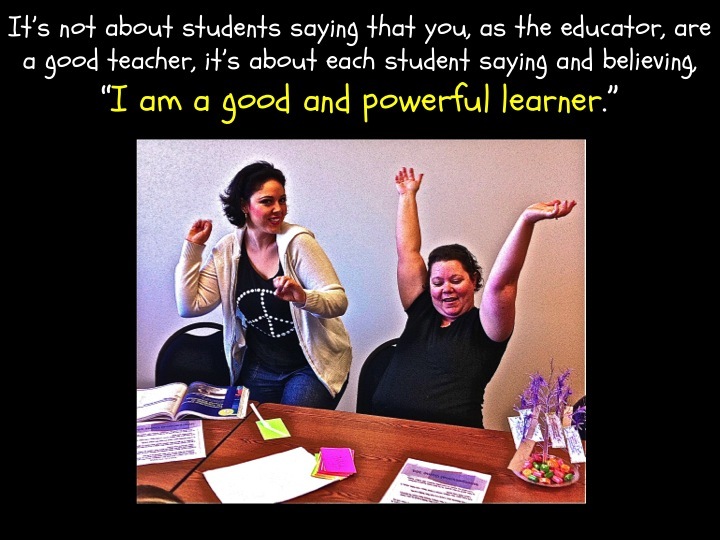 Here is an example: 10 Amazing Teacher Promises for the Beginning of School. 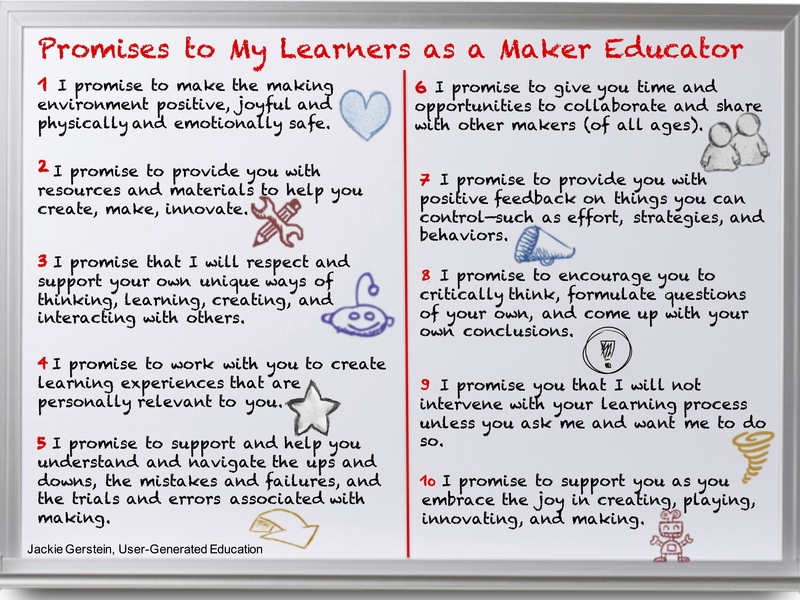 As I prepared to teach a summer school/camp on maker education (see http://www.makereducation.com/summer-camp-schedule.html), I decided compose a list of promises to my learners as a maker educator. I promise to make the making environment positive, joyful and physically and emotionally safe so you feel safe enough to take risks, ask questions, make mistakes, and test things out. I promise you to provide you with resources and materials to help you create, make, innovate. I promise that I will respect and support your own unique ways of thinking, learning, creating, and interacting with others. I promise to work with you to create learning experiences that are personally relevant to you. I promise to support and help you understand and navigate the ups and downs, the mistakes and failures, and the trials and errors associated with making. I promise to give you time and opportunities to collaborate and share with other makers (of all ages). I promise to provide you with positive feedback on things you can control—such as effort, strategies, and behaviors. I promise to encourage you to critically think, formulate questions of your own, and come up with your own conclusions. I promise you that I will not intervene with your learning process unless you ask me to do so. I promise to support you as you embrace the joy in creating, playing, innovating, and making. Update/Addendum: Last evening I traveled to Albuquerque with a friend to see the makerspace there and attend their monthly meeting. It is a very well-appointed makerspace and there was good attendance for the meeting. I discussed with my friend on the drive back home my concern with the homogeneous demographic make-up of those in attendance. They were mostly white men and women who seemed to have a comfortable income. I stated that given that this makerspace is fairly well established with a five year history, the folks running the space should now be more proactive in increasing the diversity of their membership and becoming more inclusive. My friend took issue with my comment, saying that this is not their purpose. She basically said that the makerspace is what it is, that becoming more inclusive is not their purpose, and that they doing fine with those who they are currently serving. I talked about initiatives like Black Girls Code which does outreach for the goal of providing skills to a population who might not gain these skills without this type of outreach. She saw no reason for this makerspace to change their status quo. We ended up agreeing to disagree but I did get motivated to revisit and update this post . . . 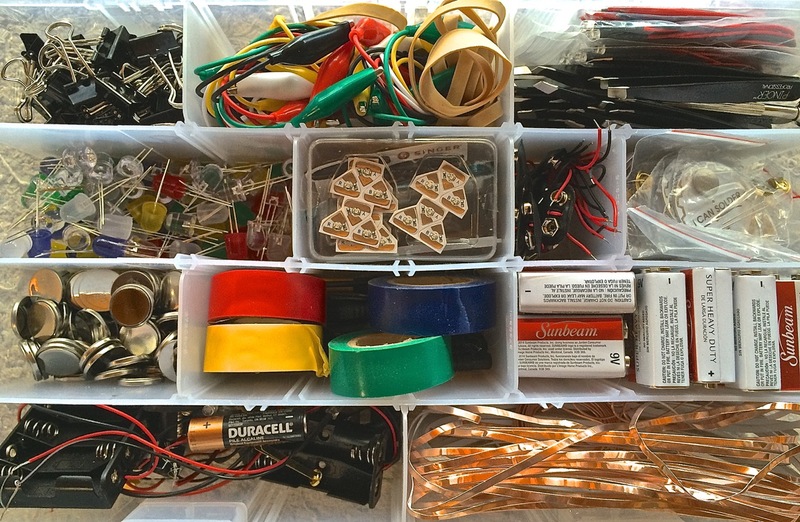 The maker movement and maker education, in my perspective, are such great initiatives – really in line with what student-centric education should be in this era of formal and informal learning. Maker movement initiatives are often driven by more affluent white males. The maker movement is too often being associated with the tech stuff – 3D Printers, Arduinos, littleBits, Makey-Makeys – stuff that less affluent schools and community programs can afford. 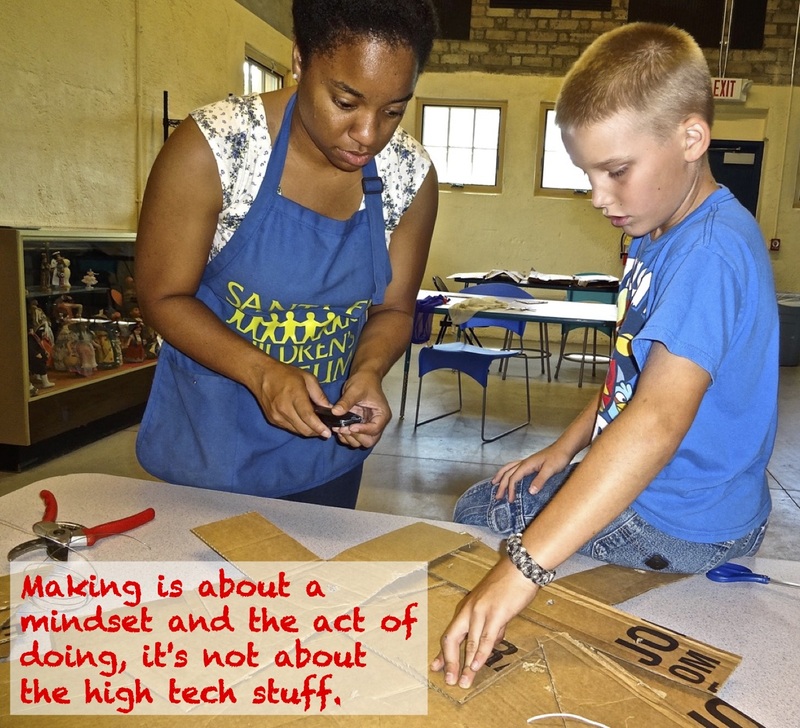 Maker movement initiatives are often driven by affluent white males. 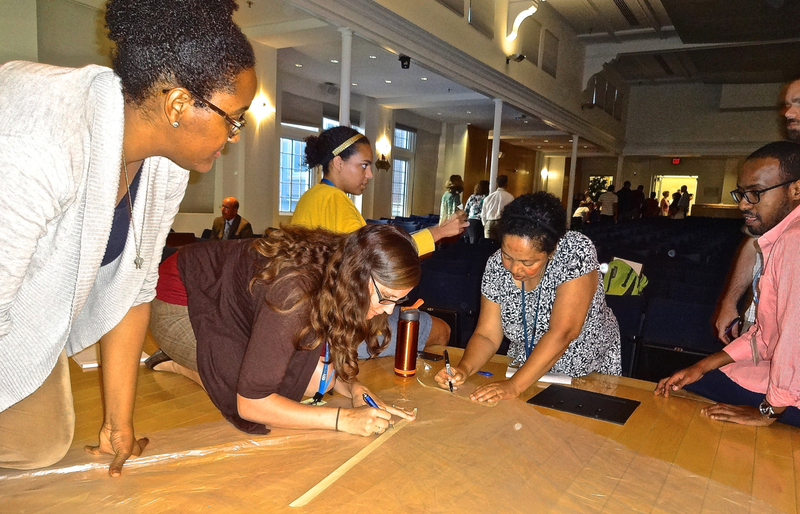 When the language, culture, and tools of the current makerspaces, maker faires, MAKE publications are examined, they tend to be less inclusive of females, older adults, and people of color. Here are some additional quotes, articles that discuss the need for a maker environment more inclusive of gender and people of color. The maker movement is too often being associated with the tech stuff – stuff that less affluent schools and community programs cannot afford. 3d Printers, Ardinos, litteBits, Makey-Makeys, GoSpheros, Lillipads, . . . oh my! These technologies are seductive especially seeing all the press they get on social media, blogs, and Kickstarter. Given all of the media coverage, an educator new to Maker Education may get the perception that it is all about this kind of high tech stuff. For less affluent schools or after-school programs, it may seem that maker education is out of their reach given budgetary restraints. 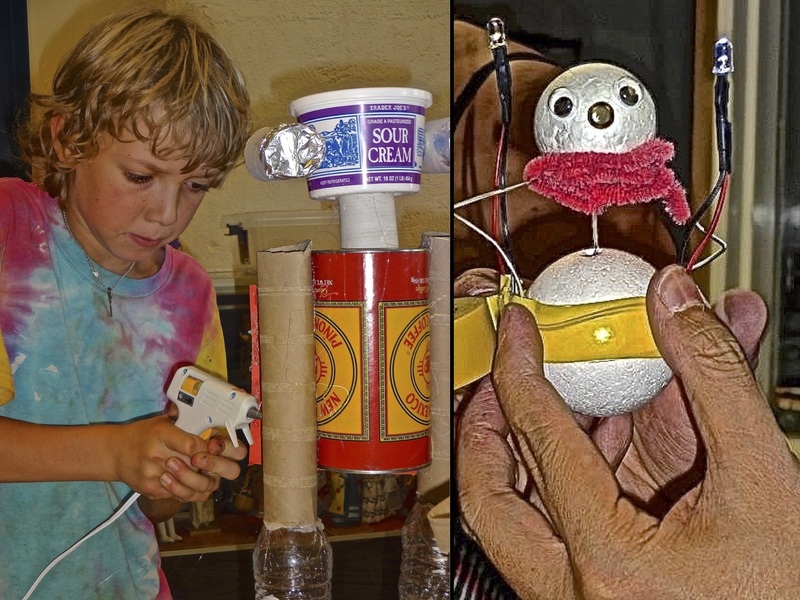 A maker education program can be fully implemented with minimal cost supplies. Cardboard boxes, recycled materials such as water bottles, detergent bottles, and other plastic throwaways, tape, glue guns, scissors/knives, and markers in conjunction with learners’ imaginations, creativity, and innovative ideas can be the stuff that makerspaces are made of. In addition, there are lots of making resources that are inexpensive. Here is an image of the circuit kit I prepared for my week long maker camp for over a dozen kids. It cost less than $100 with careful shopping via ebay and the local dollar store. It contains LEDs, batteries, alligator clips, copper tape, magnets, paper clips, and electrical tape. It served these dozen+ kids for five half days of making. In addition, to using cheaper materials, we need to expand our perceptions about what constitutes maker activities. If making, the maker movement, maker education is viewed as a mindset, as a process, as a way to be creative and innovative; then the types and kinds of materials don’t matter. What matters, first and foremost, is the act of making. I absolutely love all of the emphasis on mindsets these days. 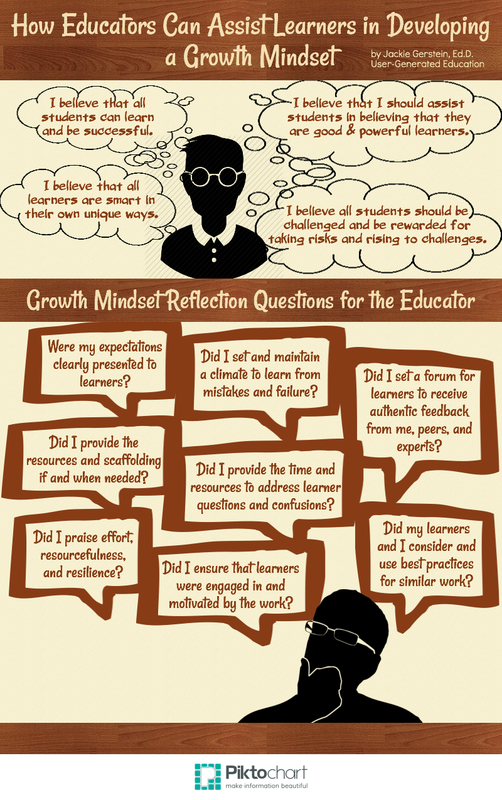 There are growth mindsets (which I discuss in The Educator with a Growth Mindset: A Staff Workshop) and maker mindsets (which I discuss in The Mindset of the Maker Educator). Mindsets are simply defined as “the ideas and attitudes with which a person approaches a situation.” Mindsets imply that mental and attitudinal states can assist one in being successful with a given skill set. I believe this to be true for engaging in the creative process, that a creative mindset is a prerequisite to being creative. Many new ideas, because they are new and unfamiliar, seem strange, odd, bizarre, even repulsive. Only later do they become “obviously” great. Other ideas, in their original incarnations, are indeed weird, but they lead to practical, beautiful, elegant things. Thus, it is important for the creative thinker to be able to suspend judgment when new ideas are arriving, to have an optimistic attitude toward ideas in general. 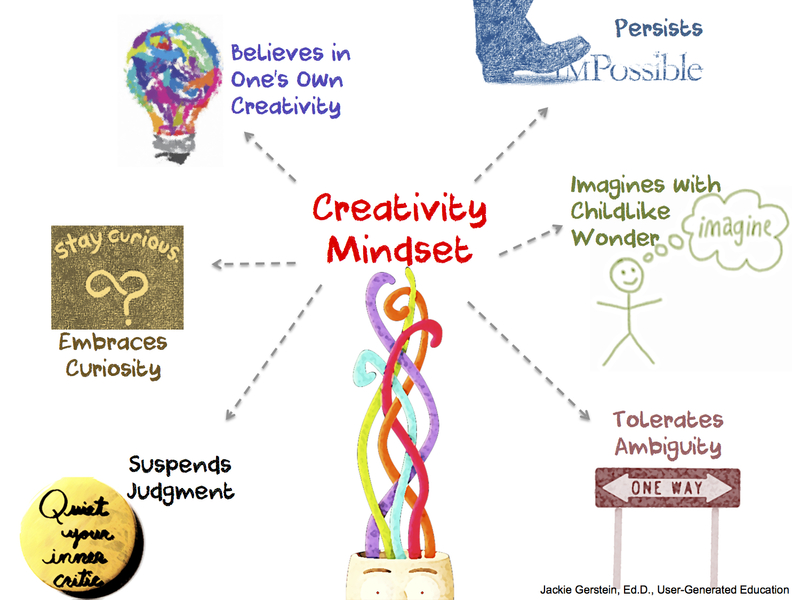 I wholeheartedly believe that both educators and learners in any educational setting need to have a Creativity Mindset to grow, flourish, and feel accomplished with their learning. Challenge the common myths that block creativity. Many ideas about creativity have developed in people’s minds that influence the procedure of creativity in a negative way. Ken Robinson (2011) states that every person possesses a huge creative potential, simply by virtue of being human. Create a time-space oasis for creativity. According to John Cleese (1991) the most important factor is to provide an appropriate physical environment and enough time to become absorbed in a task, then work persistently on the solution, this is called a time-space oasis, a necessary condition for creative production. Formulate a serious but playful atmosphere. Humor and playfulness decrease anxiety and thus make us more open to new approaches. I am an adjunct faculty for several teacher education and educational technology programs. I have been so for a few decades. During that time I have noticed the changing nature of student behaviors and expectations regarding their class projects and assignments. Students seem to expect perfect grades for not so perfect work. I can predict that when I “mark down” a student, I will receive a complaint about that mark down (it happened just this evening) even with clear cut and concrete grading criteria like uses references to support ideas in blog posts, includes copyright available images. Mediocre is often good enough for me as long as I get the work done. I expect my teachers to give me full credit for completion and submission of my work. Quality is not a variable. It is okay to just do “enough” work to minimally fulfill the requirements. Good grades are what really matter to me. I am not really interested in receiving qualitative feedback. In response to these experiences, I developed a Personal Accountability and Reflection series of questions. I will suggest that students use this “checklist” in order to develop and enhance their growth mindsets through personal accountability and reflection. Did I work as hard as I could have? Did I set and maintain high standards for myself? Did I spend enough time to do quality work? Did I regulate my procrastination, distractions, and temptations in order to complete my work? Did I make good use of available resources? Did I ask questions if I needed help? Did I review and re-review my work for possible errors? Did I consider best practices for similar work? Is my work something for which I am proud – that I would proudly show to a large, global audience? 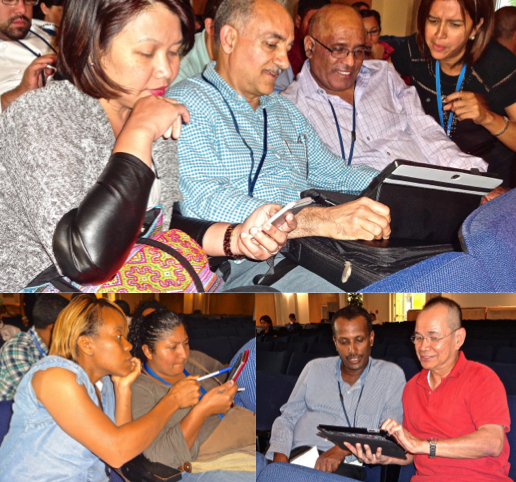 I had the great privilege of facilitating a staff workshop on growth mindsets for the teachers and staff at Carlos Rosario International School and more recently at ISTE 2015. Participants were given access to the slide deck in order interact with the slides and resources during the workshop. What follows are the activities along with some of the resources used during the workshop. It began with the viewing of a few “inspirational” videos. 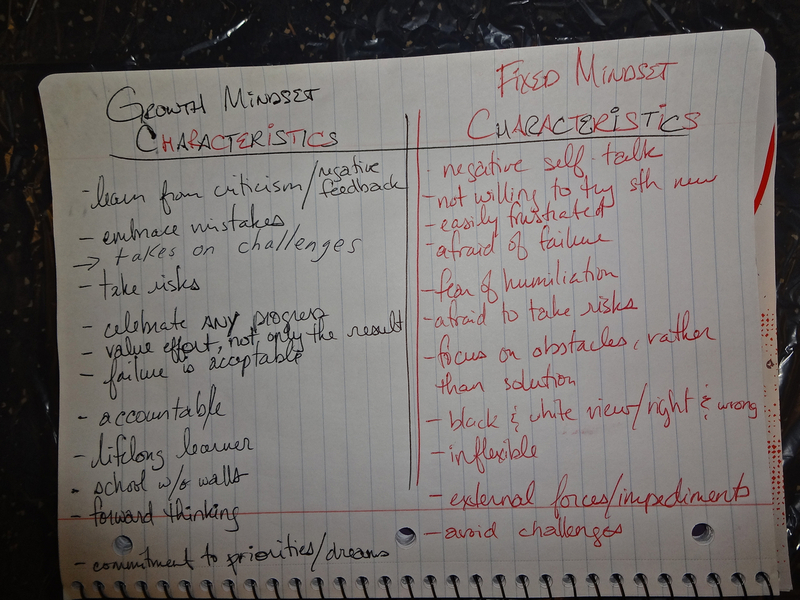 Online resources were provided and small groups (prearranged prior to the workshop based on teaching disciplines) were asked to explore and list the characteristics of both growth and fixed mindsets. 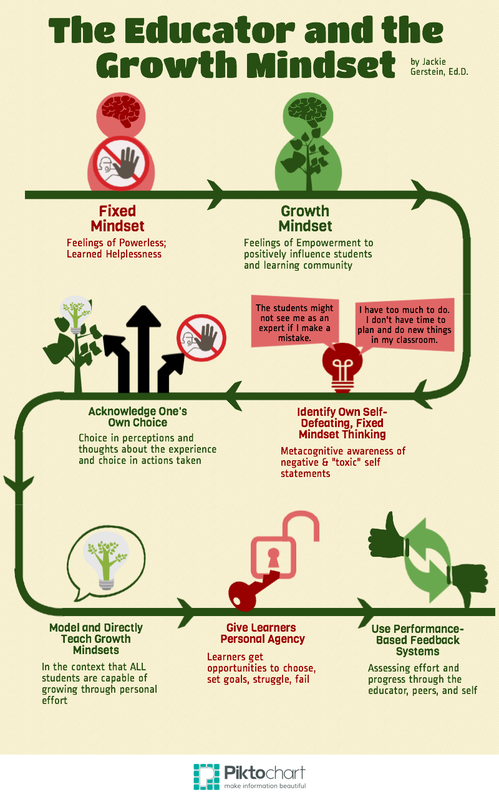 They provided with a link to this The Educator and the Growth Mindset Thinglink (which contains lots of linked resources). 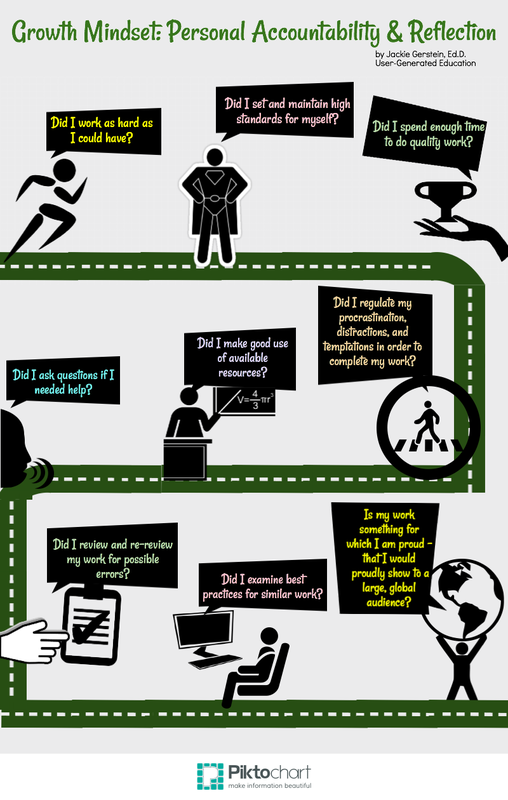 Note – I created the graphic first using Piktochart. 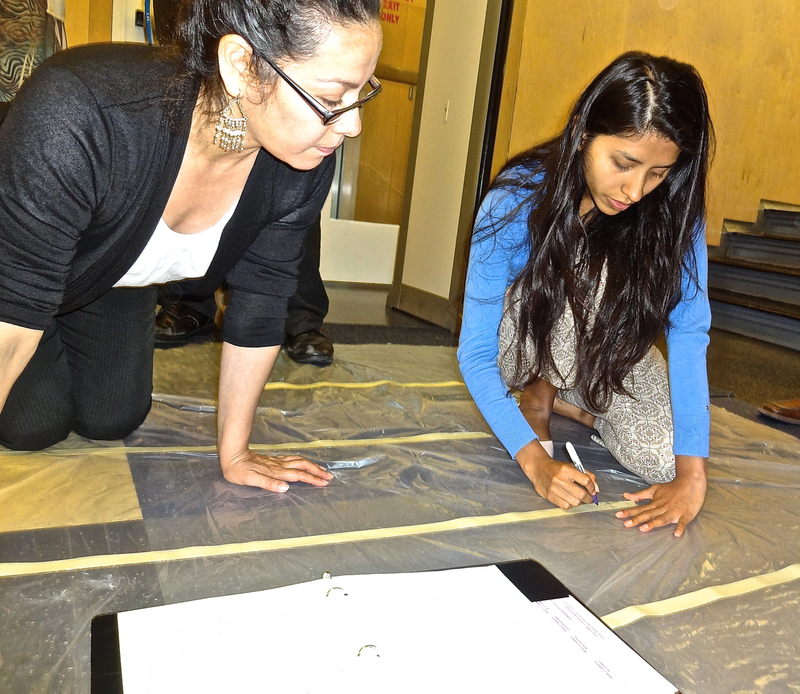 Then came an experiential activity called, Flip the Tarp. On one side of the tarp, using masking tape and markers, they listed characteristics of fixed mindset. They were then asked to flip their tarps. 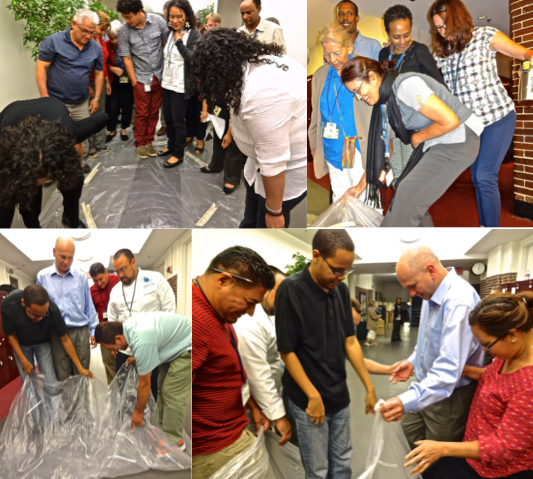 They were instructed to have all their team members stand on the tarp with the fixed mindset characteristics facing up. Their task was to flip the tarp, with no one stepping off of the tarp while doing so, so that the side with the growth mindset characteristics were facing up. When we were given this task, we first said that there was no way to do it – a fixed mindset. Then someone offered a suggestion, we built off of that and ended up with a growth mindset and finishing the task. Each one of us had our own perspective about how to do this. When ideas were thrown out, we developed other perspectives – thinking outside of our own boxes. Sometimes we don’t realize our progress, that we are blind to it, but we have to trust that process. 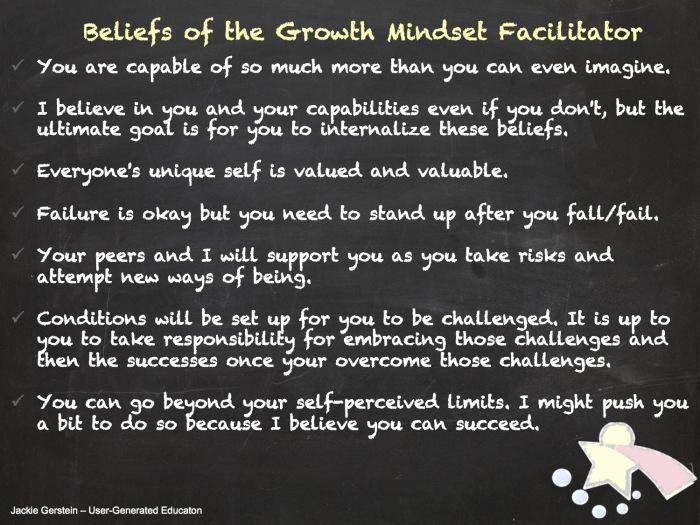 The next activity was an educator self-assessment of growth mindset behaviors. These can be found in the slide deck. 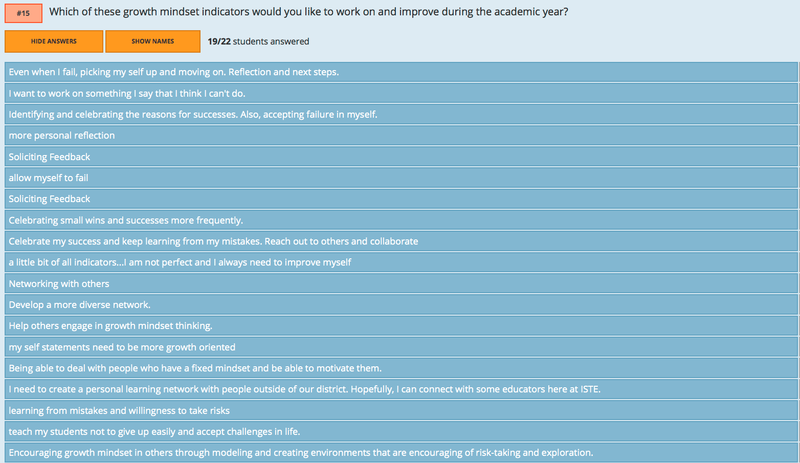 After reviewing these, Socrative was used to do an anonymous polling of these self-assessed items. 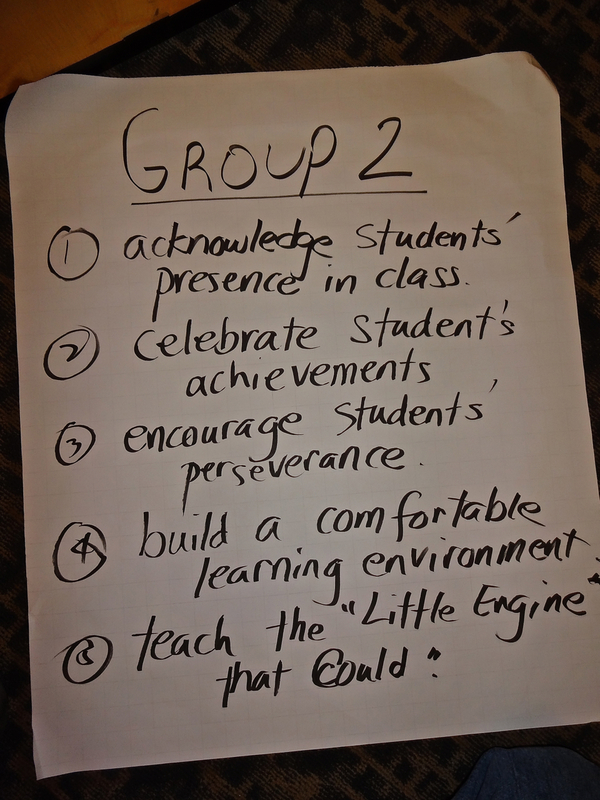 The final component of the workshop was having the teams examine and develop strategies for increasing the growth mindsets of their students. I agree with the idea of positive thinking. Presentation went quickly. Enjoyed the different activities. it was great! but it went a little fast. She kept moving when i would have liked her to explain some things a little more. I like her message and she gave very good examples. I thought what she shared were some good reminders and I look forward to being more purposeful about using her overall thoughts and more specific ideas as well. I found the discussion portion useful. We have kept the momentum going since your visit! 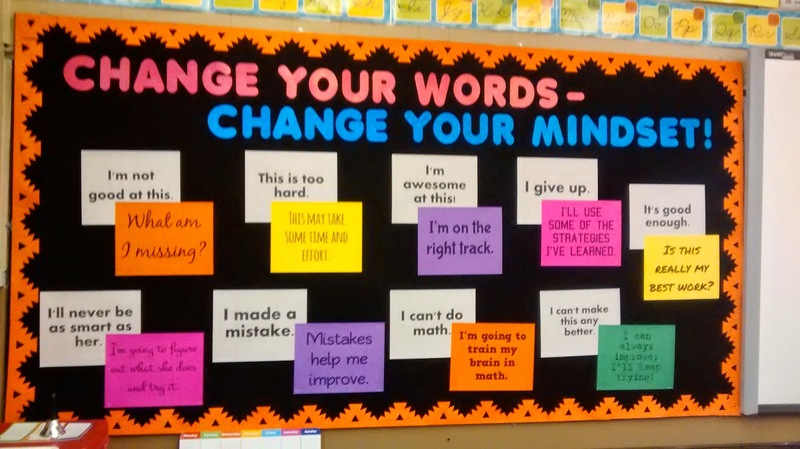 Our teachers have incorporated growth mindset concepts into their classrooms and lessons. Posters praising effort and persistence can be seen in classrooms, teachers deliver growth mindset specific lessons, and teachers are more thoughtful and intentional about praising students who worked hard and made gains, however small they may be. We have started attendance celebrations for students. Attendance is something we struggle with as adult ed is non-compulsory. Students are entered into a raffle for highest attendance and also most improved, again reinforcing effort. Teachers are more intentional about sharing student data and progress with individual students. In many of our classrooms now we have students tracking their own test scores and reflecting on progress in special sections of their notebooks. I also think our school leadership has become more intentional about celebrating our teachers successes from big to small.